The collection will add a rich supplement to the Motorsport Images digital archive that now holds 23 million assets under management, as well as providing selected iconic images from the collection for the limited edition motorsport art service, Motorsport Gallery, scheduled to be launched next week. Ercole Colombo grew up in Italy, where Ferrari carries a nation’s expectations every time it races and he has been a familiar figure in the Grand Prix paddock since the late 1970s. 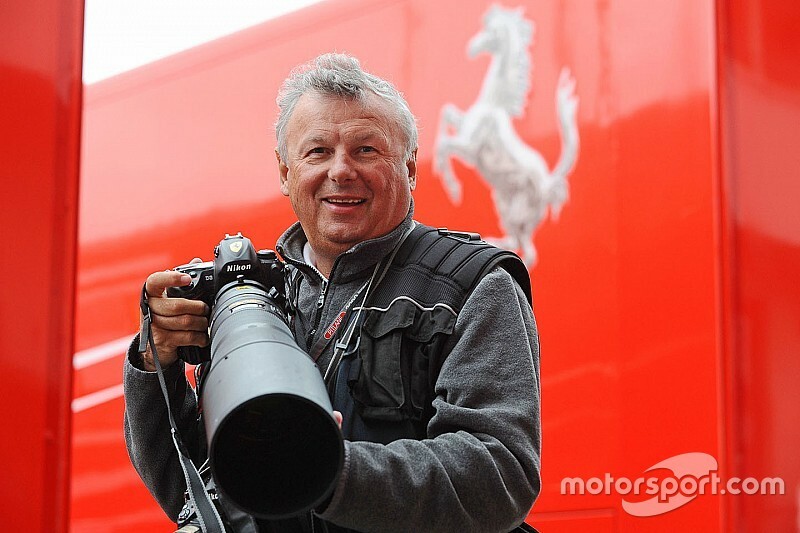 In this time he has shot the most extensive collection of images recording the highs and lows of the famed Scuderia. The investment in arguably one of the most significant visual records of Ferrari’s racing history marries up with Motorsport Network’s stewardship of the world’s largest online Ferrari community – FerrariChat. Colombo’s archives paint a vivid story of the hundreds of races, drivers, and influential moments to which he has been an eyewitness. His access, unerring eye and instinct for the decisive moment enabled him to capture a unique history of the sport with Ferrari at the heart of his passion. His work with Ferrari over the past 40 years has documented many unique images of the team at work as well as an intimate record of Enzo Ferrari, with whom Colombo enjoyed a cordial personal relationship that lent him unparalleled behind-the-scenes access. Colombo’s photographic reportage also spans the team’s halcyon period from the mid-1990s and into the 2000s during Michael Schumacher’s period of unmatched supremacy – right through to the current day. Cherished by motorsport enthusiasts, the Italian photographer has been the recipient of numerous awards and accolades, and his 1979 image of Jody Scheckter en route to victory in Monaco earned him the Dino Ferrari award that year. “We always promise as an organization to move fast and be distinctive. And this is a big one for us," said James Allen, President Motorsport Network, "Ercole Colombo’s archive takes us right to the heart of motorsport’s most iconic race team. I remember 30 years ago when I started working in F1, I encountered Ercole; a huge personality, passionate about his subject and a man who was completely in control of both his craft and his environment. Nothing’s changed since, except that he has witnessed history and captured it - countless times through his lens. “From a business point of view, this archive complements perfectly those we already hold from Schlegelmilch, LAT, Sutton and Piola and cements our position as the number one go-to destination for consumers and businesses wanting access to the world’s largest and most distinctive motorsport image archive." The Ercole Colombo archives will form part Motorsport Images alongside the work of Sutton Images, LAT Images, Rainer Schlegelmilch and Giorgio Piola. In addition to Motorsport Images, Motorsport Network offers 28 global editions of websites including Motorsport.com, Autosport.com and Motor1.com presented in 17 different languages.